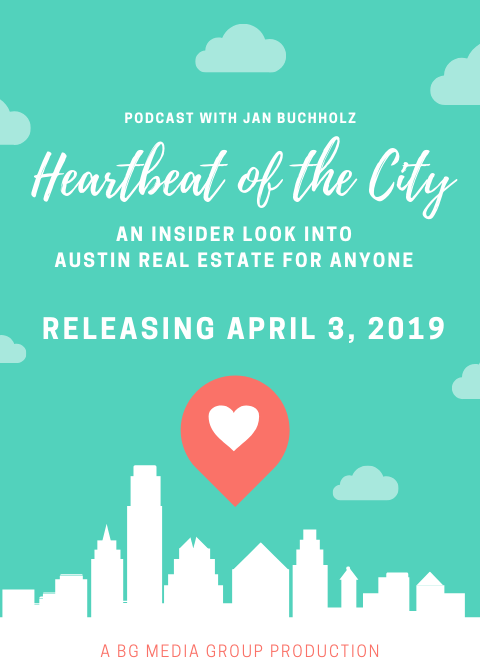 We are excited to share with you a new Bingham Group collaboration- a podcast with Austin real estate insider Jan Buchholz. Jan is an award-winning real estate and business reporter, who is known locally for her journalism in the Austin Business Journal and her website ATX Real Estate News. She is known for breaking industry news before the rest and her passion for real estate- both of which inspired the creation of Jan’s podcast Heartbeat of the City. Heartbeat of the City is Jan’s newest journalistic beat where she covers the city- real estate. In these podcasts, you will hear her take on the biggest areas impacting Austin real estate. This podcast is the first production of our new venture, BG Media Group, where we highlight incredible talent and help build their platform with the community. Look forward to content from Jan and other trailblazers on BG Media Group. We have loved working on this project with Jan. You can listen to her pilot series this Wednesday at 8 am on the brand new BG Media Group website. We will be posting a link to this content on Wednesday both here and on Jan Buchholz’s website, so follow both to access this incredible content.